The Lake Placid Land Conservancy (LPLC) invites you to get to get to know your local plant and animal communities through citizen science monitoring. Monitoring helps us to better understand the species, habitats, and other natural resources that make up our ecological landscape. You will be part of a network of citizen scientists and naturalists who are concerned about long-term changes to our natural world. With your help, we will establish a living map of the birds, butterflies, mammals and wildflowers that make up our landscape and the invasive species that threaten their integrity. The information you collect provides current data that can inform management decision, can identify ecological and climatic changes over time, and promote a better understanding of the ecology and biodiversity on private lands in the Adirondacks. LPLC uses a free program called iNaturalist to collect and store monitoring observations. Our goal is to help you become an expert in using this program and in collecting observations on your property. We will discuss the components of a great citizen science observation, and how consistent monitoring provides information about your property’s unique conservation values, such as the presence of species, their habits, how and when they move, and they interact with other wildlife. Enrollment in the Conservation Monitoring Program is free and will provide landowners with a written assessment of their property’s habitat and natural resources. Additionally, the program will provide landowners with the opportunity to connect with a network of landowners and conservation organizations involved in voluntary conservation monitoring. Working together, we can make a difference in how our landscape is managed over time! We will support you in monitoring your land using traditional citizen science methods, but we tailored this program to specifically work one-on-one with you on your property. Monitoring allows you to track the benefits of your management activities and also allows you to share what you learn about your land’s natural resources and wildlife features with your friends, family, community, and beyond. We partner with state and local agencies, researchers and conservation organizations to create a better database of species and habitat within the Adirondacks. Partnership monitoring allows you to get involved with conservation issues in your community that may benefit research efforts at a larger scale. We have also partnered with AdkAction, The Wild Center, and the VIC at Paul Smith’s College to form the Adirondack Pollinator Project. 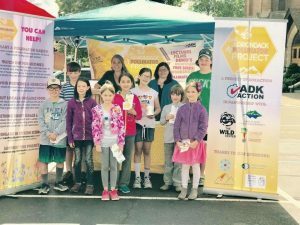 This initiative focuses on build understanding about the global and local importance of pollinators, and to empower people to take individual and collective action to help pollinators thrive. One of LPLC’s goals in the project is to expand the reach of our Conservation Monitoring Program and initiate more citizen science involvement with local landowners, businesses, organizations, and schools. We know that by working together, great things can happen! 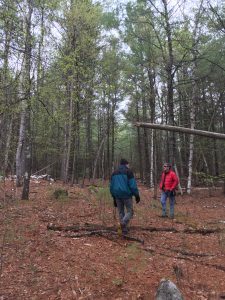 We designed a Citizen Science Monitoring Program that listens to the conservation management needs and interests of landowners and contribute to a broader understanding of the ecology of private lands of Adirondack communities. As part of the program’s development in 2016, LPLC mapped critical ecological, political and economic features of private lands in the region using Geographic Information Systems (GIS). The mapping information was shared with landowners, community leaders, local governments and other community organizations at LPLC’s community conservation workshops. The multi-phase development of LPLC’s conservation monitoring program is designed to not only engage landowners and understand issues affecting continued conservation of private lands in the Adirondacks, but over time, support conservation needs and interests of landowners and communities within LPLC’s focus areas by creating a network of landowners actively engaged in conservation monitoring. Lake Placid Land Conservancy is initially focusing its monitoring efforts on three regions within the Saranac River and Ausable River watersheds. These Focus Areas include Lake Placid, the East Branch of the Ausable River and Saranac Lake. The three focus areas are highlighted in the map below. The Lake Placid focus area contains lands within North Elba, including lands along Lake Placid and the West Branch of the Ausable River. Lake Placid Land Conservancy currently holds two conservation easement within this focus area. 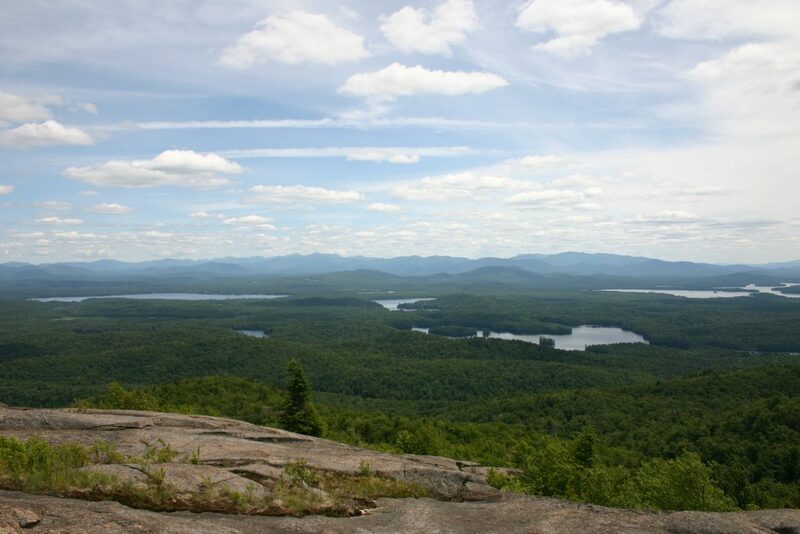 View our Lake Placid focus area maps here. This focus area includes communities along the East Branch of the Ausable River, including Upper and Lower Jay, Keene and Keene Valley. Lake Placid Land Conservancy holds one conservation easement within this focus area. View our East Branch of the Ausable River focus area maps here. The Saranac Lake focus area comprises lands within the Saranac River watershed and includes lands surrounding the Village of Saranac Lake. 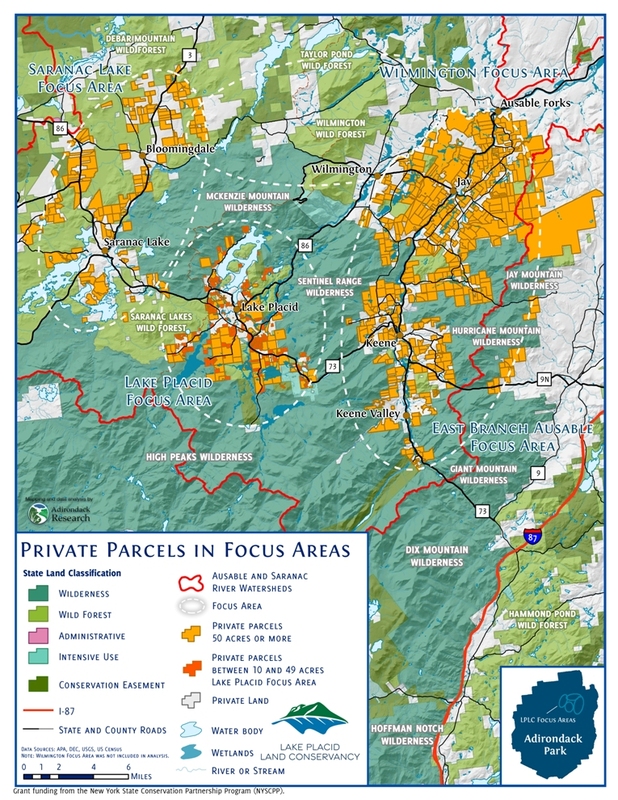 View our Saranac River Basin Communities focus area maps here. Interested landowners have the opportunity to enroll in LPLC’s Conservation Monitoring Program anytime! We want to work with you to determine how we can best achieve your conservation and stewardship goals. We will help you access land management resources and information about stewardship options. We will first meet with you to discuss your conservation goals and objectives. Once enrolled, we will evaluate your property using currently available GIS data. We will then visit your property to “ground truth” our evaluation and work with you to develop a plan where you monitor pollinators, birds, mammals, invasive species, or all of the above, on your property. When possible, we will also make land use and management recommendations that may create more opportunities for wildlife to visit your property. Evaluations and assessments of your land and will include development of a GIS analysis of your land’s habitat and resources as well as sets of inventories. We will evaluate the suitability of your property for monitoring and make recommendations based on our findings. 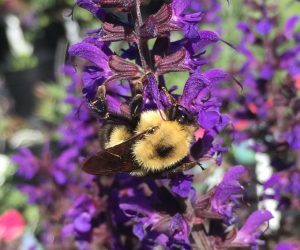 Our recommendations for monitoring will also be based on your management goals and objectives as well as your property’s conservation values and your interests involved in monitoring for pollinators, wildlife, invasive species, and birds. Once our recommendation is made, we will work with you to implement the monitoring protocols. Our goal is to facilitate continued engagement in land stewardship activities. Contact us and we will be happy to talk about our conservation monitoring program in more detail.